Whitby is a well known Harbour Town in North Yorkshire. Probably best known for the ruined Abbey that features in the Dracula novel, being has it was written by the author Brams Stoker whilst looking out at the Abbey. It is also has a large Harbour which lands fresh fish everyday. This was the main reason for going, when I was a teeneage I spent a week there with school and remember seeing fresh crab being sold. Nuch loves seafood and was pleased to find several shops selling crab, lobster and prawns. That part of the trip completed we set about finding somewhere to eat. I had heard of Magpies Fish and Chip shop, a superb reputation and always a que to get in, guess what? There was a bloody long que so we ended up at a restaurant called Marina. Nuch had a huge lobster, apart from the messing about she really liked it. There are plenty of little shopping streets selling all sorts of nik naks and touristy stuff, the North Yorkshire Moor as a station there and the Moors are only a few miles away. Other near attractions include Robin Hoods Bay and Staines. Even though its getting quite a bit north, Whitby is just about a day trip destination from Derbyshire. My little baby girl is four years old today. She is growing so fast and becoming a bright if not always good little girl. This time next year she'll be going to school!!!! The Wavecrest Hotel carried on beating my expectations, the breakfast was superb. Today the weather was against us. We started off going to Shell Island, I'd promised Elizabeth we would go crab fishing. Unfortunately the tide was coming in and we had to wait an hour to start crabbing. On the first cast Elizabeth caught two large crabs, she nearly crapped herself when she pulled them out, seriously funny!!! For lunch we went into Harlech, famous for its Castle. We found a great place called Le Plas Restaurant right across from the Castle. The food was outstanding and again, another place I would definately visit again. The following day we went to Beddgelert in Snowdonia, Beddgelert is a sleepy little village in the middle of North Wales. It is famous for the tale of Gelert the dog. There are plenty of shops and the walk down by the river is really nice. I love to visit Wales, although next time, a visit in season would be better. On saturday we set off for North Wales. Its the second time I've been there in as many months. This time Nuch came along with Elizabeth and I. First port of call was the waterfalls at the foot of the Cader Idris. Although we kept to the path, it was quite a difficult climb for Elizabeth and Nuch. We could hear the waterfalls but didn't get to see them. From there we called at the Tal-y-bont Pub on the Tal-y-lyn Lake, outstanding views and lots of memories for me. I used to go on holiday with my grandma to this place many times and had many good times. Then it was on to Tywyn and Halo Foods factory shop, they are one of the few places to make Honey Ice cream. they are still there and the taste is out of this world, always worth a visit. We left Tywyn and went in search of sunday lunch. Between Tywyn and Barmouth we found a little village called Llwyngrwel, and in the middle of the village we found the Garthangharad Hotel. What a find, superb food, excellent service and the bill (£20.70) made this place one to visit when next in the area. We arrived in Barmouth and I immediately went in search of somewhere to stay, I tried several places, but being near the end of the season places were at a premium. Again we struck gold, the Wavecrest Guest House was run by a lovely welsh couple. The room had an excellent view of the beach and at £75 per night was excellent value. I don't like recommending Hotels and the like, but the Wavecrest is a must. Settled in and after a long walk on the beach we tried to find somewhere to eat. Trust me Barmouth at the end september is not the place to find many restaurants open!!! We ate at The Anchor and Guess what? The meal was superb. Elizabeth is 4 on Wednesday, this year we decided to have her party at Chucklebutties in Belper. Last year we organised a party round at our house, whilst it was good fun, it turned out to be alot of work and in the end alot if money. It was also vey dependent on the weather which can be very iffy this time of year. Chucklebutties is in the old Mill canteen at Belper Mill and as an excellent reputation as a kids play centre. The obstacle course for the kids is great and the food for the adults and children. Elizabeth invited ten of her friends, mostly from Nursery. There is definately a mafia amongst the nursery kids, a heiracy and a good bond between them, you have to laugh. Everything went off without a hitch and I think everyone enjoyed themselves. We will be having a little party on Wednesday on her actual birthday. Its the 50th day since I found out that I was a chronic type 2 diabetic. Strange as it may seem, since knowing that I have this illness I feel 100% better in myself. I can now put a lot of the problems I was facing with temperament, depression and no self worth were directly associated with suffering from diabetis and not knowing it. My weight loss seems to be slowing down, but then again I feel and look alot better than I did. The diet is still on the go, however I have had a couple of lapses, but they don't seem to have done me any harm. I think I'm beginning to live with this thing. I need to get back on my bike, I've not been on it for a fornight and it seems unlikely I will for the next two weeks because I'm very busy at home. Taking the tablets is no problem, I have always taken some sort of tablet for the last 16 years, so a few more wont hurt. Last night I took a glucose reading, it came out at 9 mmo/l. This was very pleasing, I seem to be averaging out at 10 - 12 mmo/l, whilst still high, its alot better than it was. Firts 50 days, I'll give myself a thumbs up!!! Last weekend Bangkok saw its first demenstration since the bloody clashes between the army and the red shirts. This time the red shirts were out in force to commemorate the 4th anniversary of the military coup. The coup was a peaceful affair which succeeded in ousting Thaksin Shinawatra from power and eventually installing a military controlled Democratic party. The troubles in may were basically organised by Thaksin through proxy's and sadly ended in over 90 people being shot dead and hundreds wounded. All all fairness, sundays demonstration was a peaceful affair, more like a carnival than a demo. The Police were on hand, but weren't needed. Maybe if the demo's in May had gone off this peacfully, then maybe we might be at a different happy place now in Thailand. 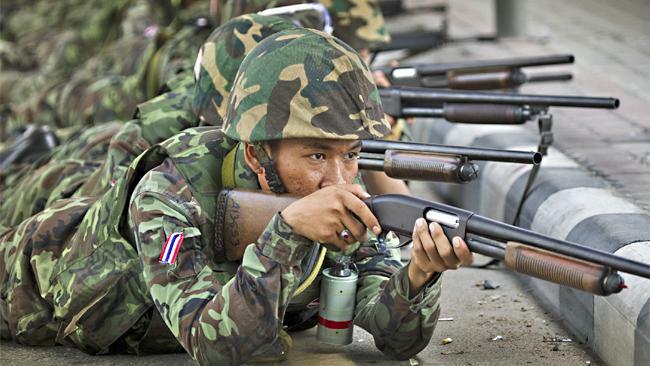 This year Thailand as seen more than its fair share of action, tension and bad news. I'm surprised the current PM Abhisit isn't greyer than a grey thing. Still no end in sight to the politcal unrest. There have been rumours of an amenesty for all sides over the unrest over the last two years. Sadly this as been squashed by the goverment. 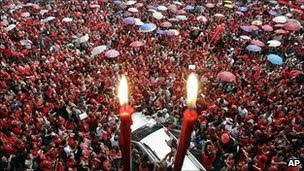 The Reds are planning a series of marches this weekend to commemorate the 4th anniversary of the last coup. It seems a perfect excuse for the resumption of violence, the police and Army are very ready for any troubles. Until elections are held and all sides except the result, there will be no end to these problems. I've said this dozens of times, but it will never happen. Too many vested interests!! The Thai Baht is going into overdrive, now standing at 47 baht to £1, thats down from 74baht five years ago. In short my money only goes 60% of the way it did five years ago. Whilst the loss of my money means nothing to Thailand, the loss of potential exports will be a problem in the future. Unrest in the south of the country as been notched up a gear in recent months with a killing most days, no progress is being made and none looks like its imminent. Other problems are lack of Press freedom, emergency decree still in affect in Bangkok. Drugs and crime on the increase, aswell as certain comodities going through the roof in price. Supposed tourist scams, corruption in all levels of life and the on going bad reputation of the naughty night life. 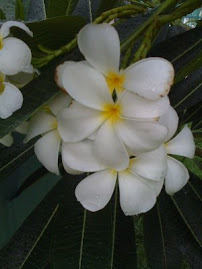 I hope things get better, I love Thailand and its people and it hurts to see all these problems in their day to day life. Thailand as been lucky to avoid the latest world recession, but things have a nasty habit of catching up with you at some time. Yesterday I had an appointment with the Diabetes Nurse at Whitemoor Clinic. I had a thorough examination including Blood Pressure, Weight, pulse and bizzarely my feet! The blood pressure was spot on fine, my weight is still to much. However I was told that Glciazide tablet I'm taking can make you put weight on any my heart rate of 78bpm was fine. Feet are a good indicator of your bodies health when you have diabetes apparently. I had to have a sensitivity test and make note of any blotches so as to compare at the next exam. I will shortly receive an appointment to go and have a full eye test at the Hospital, again eyesight is a pontential problem when you have diabetes. I was also given a diabtese folder and will have an appointment sent through to me to go and get help from a diabetes support group. On the whole I feel a whole lot more healthy than I did 40 days ago, I'm not in control yet, but I'm getting there. Thanks to Oneditorial for this little Gem. The Daily Express published this report online, it claims that due to English womens behaviour on the drinking, dressing and being ugly are the worst specimins of women in the world. I quote "BRITISH women have been branded the ugliest in the world in an ­international poll. They were slated for their bad behaviour, dress sense and drinking habits when on holiday. Many are accused of being “rude”, “drinking pints of beer like men” and “ending up drunk in the gutter”. They also shamelessly broke wind and belched while lying around hotel pools or on beaches, according to the survey for a respected holiday website." What a day! It was the day of my first real hard ride. The guys from my old bike club met up on a memorial ride for a mate who died in an accident whilst out training a few years ago. Ten turned out for the trip, from the off it was uphill and bloody hard. I was straight to the back and was playing catch up all day. Only on one of the decents did I overtake some body. Basicallythe route took me up through Wirksworth, up to the trig point at Black Rocks, up the last two inclines of the High Peak Junction then up to the tops of Middleton. Finally a decent down to Grangemill, then up again to Ible before a decent down through Bonsall to Cromford. Unfortunately, at the top of Ible, had a mega hyperglicaemic attack, my blood sugar level dropped very quickly and I had to sit down before I fell down. I ate two cereal bars and carried on. It caught up with me again at Cromford and I was forced to stop at The Greyhound Pub. I had a pint of Coke, a packet of crisps and a bar from Lee. Lee was a proper Mate, he arranged to have me taken home and looked after me. When I got home, I treated myself to a Macdonalds thinking it would help bring my sugar levels back to something like. It didn't work and I took my Glucose levels later they were a very low 4.7 mmo/l. I now know that racing is out of the question for a long time! I need to get fit steadily, not so Gung Ho! As most of you know, I used to do a bit of cycling. However for the last ten years I've ridden very little. Whilst in Thailand I tried to keep fit using my bike, unfortunately combining the heat and the mental traffic it was very difficult to get the riding off the ground. I undertook one MTB race in Thailand, it nearly killed me!!! I haven't raced seriously now for 12 years, the last race a road race around Darley Moor in 1999. For the last 8 weeks I've been getting back on my bike, one main reason is my health! Hard cycling is excellent for loosing weight and I've got a lot of weight to loose. The first couple of weeks were very hard, saddle sore and aching joints. Now I'm up to 2 good hard hours. If all goes well and the training and weight loss goes to plan I plan to enter a cyclo cross race on October 16th, I know what is going to happen on the day. I will find out just how unfit I am! This is a good thing. Then I'll get my proper riding head on. This sunday I'm going on an all day ride with some Mates from my old bike club, this will also be a test of endurance. The next thing will be what I do with my bike? Currently I'm riding a cheapo Carrera MTB, its heavy, but strong. I've changed a few bits on it already and should I race I'll put new skinny tyres on.